Barking Up The Wrong Tree is a curious title for a book about success. It could be a pun on the author’s name, Eric Barker, or perhaps there lies a deeper meaning. Either way, Eric’s blend of witty anecdotes and fact turns Barking Up The Wrong Tree into a winning scientific guide. I am a 17-year-old just getting to the grips with the world of Psychology, having studied it for a year at school. I see the field of Psychology to be my ‘pond’; I’m fascinated by it. But how might I successfully navigate the waters? In Chapter 1, Barker explains that to be successful one must choose the right pond. Winston Churchill is used as an example: a maverick in politics, an un-groomed leader who didn’t play by the rules. His paranoia meant he was the perfect defender of his beloved country when Hitler rose to power: one of the only Members of Parliament to see what a great threat there was. Churchill was successful when perhaps a more traditional leader wouldn’t have been. But does this mean to be successful one has to be a rule breaker, a free thinker, a radical? No. Choosing the right setting, by knowing yourself, can help you succeed. Barker discusses the importance of knowing your weaknesses. Having identified them, apply yourself to a situation where your usually ‘negative’ trait can be of some value. Before reading Barking Up the Wrong Tree my views on success were fairly simple. I viewed success as a measurable quantity primarily dictated by wealth. To be successful in the monetary sense I believed three things were needed; stupidity, opportunity and luck. To me and my pessimistic self, I assumed those who were extremely successful had to have taken risks presented by opportunity. These risks may have been more likely to fail; however those stupid enough to commit sometimes got lucky… and when they did they became 'successful'. I now realise success is made up of the big four: Happiness, Achievement, Significance (to others) and Legacy. To truly be successful you need to know what success means to you and what ratio of these four you want to achieve in your life. This is a mere glimpse into the world of success viewed through Eric’s scientific eye. Barking Up the Wrong Tree is an interesting, factual, realistic book on how to succeed. I would highly recommend it to anyone of any age, in any field, as its messages are relatable and applicable. Back to the title: if you want to become successful, change yourself, your pond. Stop barking up the wrong tree and start choosing the right path. - Josh Shepherd-Smith is a student. 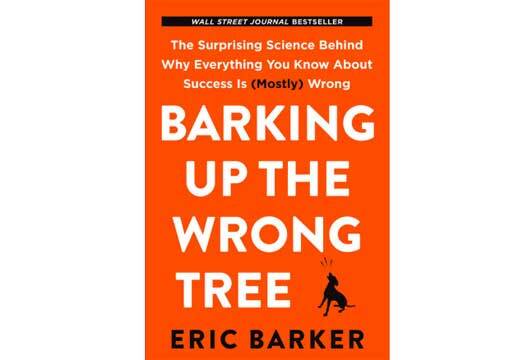 BARKING UP THE WRONG TREE – The Surprising Science Behind Why Everything You Know About Success Is (Mostly) Wrong is published by Harper One.